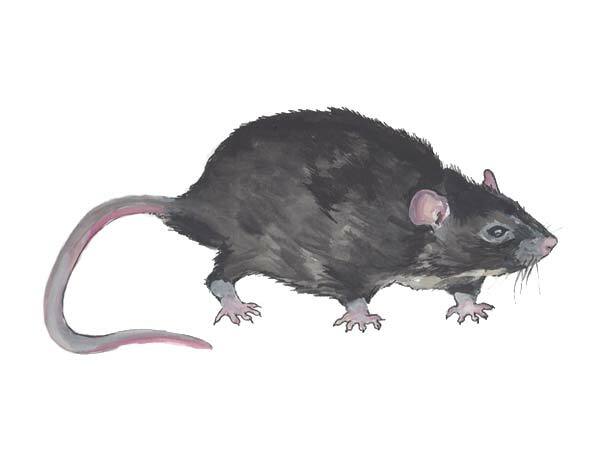 Roof rats are dark brown to black and measure 12 to 18 inches in length, including the length of the tail. Roof rats are sleek, graceful and weigh 5 to 10 ounces. Their head is pointed and their ears are quite large, with the ability to cover over the eyes. Roof rats spend more than 90% of their life 4ft or more off the ground. They are more aerial than most rodents, relying heavily on trees and other high places to establish their habitat. They can also nest in shrubs, woodpiles and thick vegetation. As the name suggests, roof rats often enter homes and buildings from the roof. They look for power lines, trees or any object touching the roof of a structure. Once established inside a building they begin to breed and thrive as a pest. Roof rats are omnivores meaning they eat food of both plant and animal origin. They prefer a wide variety of fruits, nuts, seeds and vegetables. Roof rats even eat the bark from trees and other plant material. Roof rats require water daily and thrive in areas where humans are established. Roof rats generate havoc; causing millions of dollars in damage each year and spreading deadly disease. Even worse, roof rats can spread disease without entering a room. Roof rats leave behind urine and droppings, which contain air borne viruses and disease. The inhalation of these viruses and disease can lead to illness and in some cases death. The most common diseases roof rats carry are: hanta virus, eosinphilic meningitis, typhoid, murine typhus, bubonic plague, arena virus, rat bite fever, weils disease, trichinosis and murine typhus. These diseases can lead to sickness and death. Roof rat populations can explode under certain circumstances. A female roof rat will produce more than three liters of 6-10, giving birth to more than 25 offspring each year. Because of the tropical climate, roof rats in Manatee and Sarasota counties can produce offspring all year round. The most common sign of a roof rat infestation is droppings in the attic. You may also hear noises in the attic, particularly in the evening and late morning. If you have a roof rat infestation you may find damage to electrical wires, plastics and hear gnawing sounds around roof eves. Roof rats love to eat Florida native fruits. If you have citrus or fruit trees in your yard, look out for hollowed out fruit pieces. Keep an eye out for dark, oily smudge marks. Roof rats leave smudge marks when rubbing their fur against beams, walls and rafters. Good housekeeping is an important key to preventing and eradicating roof rats. Be sure to keep garbage in containers with tight lids, keep food sealed in containers and only feed house pets enough for one sitting. Roof rats love thick vegetation so by thinning out bushes and trees it creates a less desirable environment. Because roof rats commonly enter homes from the roof, make sure to trim palms and other trees off the roof to prevent easy access to the attic. Also seal off all opening openings ¼ inch or larger around the exterior of the home. We are available to assist with all your rodent problems. We service Lakewood Ranch, Ellenton, Bradenton Beach, Parrish and surrounding areas. Call us today at 941-746-1147.